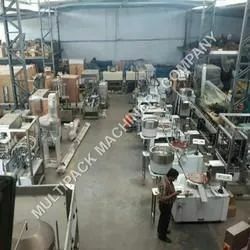 Since its foundation in the year 2011, Multipack Packaging Machinery is engaged in manufacturing, exporting, supplying and importing Filling & Packaging Machines. Our product range is elaborate and interesting. We provide Maintenance Services. It has enabled the users to increase the productivity of their work and decrease the downtime. Our range includes Shrink Sleeve Applicators, Shrink Tunnels and Stretch Wrapping Machines. The offered machines are regarded for being resistant to corrosion, non-abrasive, user-friendly, dimensionally precise and long lasting. They are used for filling and wrapping bottles in beverages, pharmaceuticals, food processing and cosmetics industries. Our modernized infrastructural facility is segregated into various sections including production unit, quality assurance, warehousing, packaging and transportation. We have access to latest generation machines for manufacturing a flawless product range. Our raw materials are procured from a reliable vendor base for maintaining the set industry norms. We have a well-equipped quality control facility for assuring the quality of the fabricated goods. Our warehousing facility is spacious and free from dust, moisture and pests. We are backed by a diligent group of professionals and they are immensely experienced. Our team members have enabled us to cater to the variegated demands of clients within the stipulated time period. Our clientele comprises of Capital Food Ltd., Intas Pharmaceutical Ltd. and Aroma De France Ltd.
Our Director, Mr. Arjun Rao, is immensely talented and has years of experience in this industry. He is energetic and has been the sole source of inspiration for the firm. We export our products in all over the world & import from Japan, Taiwan, Italy & Germany. Our quality assurance parameters have earned us a reputed clientele and loads of appreciation. We source our raw materials from reliable vendors of the industry for maintaining the international standards. Our sole aim is to provide customers with ultimate filling and wrapping solutions at industry leading prices. For accomplishing this target, we check the quality of our products based on various parameters including durability, surface finish, energy efficiency, resistance towards corrosion and ease of operations. Multi Pack has a close cooperation with major European machine producers, therefore Multi Pack is able to offer a complete range of filling and packaging machines, starting from semi-automatic to complete integrated systems. Our infrastructural facility is modernized and equipped with latest amenities. We have a well-established manufacturing facility for fabricating machines in tune with the international standards. Our quality control facility is engaged in checking the quality of goods by making use of various instruments. We have a spacious warehouse for managing bulk orders. It ensures smooth operations during packaging and dispatch. Our transportation facility is quick and accurate. It has enabled us to make timely delivery of bulk orders. Our team of workers is the reason behind our success. We are backed by experienced professionals and they are committed towards the growth of the organization. Our team consists of engineers, technicians, quality controllers, warehousing personnel, sales executives and transportation personnel. Our professionals are abreast with the latest generation trends owing to the workshops and seminars we organize at regular intervals for enriching their knowledge base. They have enabled us to operate as a customer-oriented organization. Our organization is the foremost choice of our clients owing to our large product range and quality approved products. We are supported by a team of dexterous professionals for maintaining the set industry norms. The products are made available at cost-effective prices and have earned us a recognized clientele across the globe. Our organization is known for its ethical business practices and large infrastructural facility. We operate as a client-centric organization and are known for timely delivery of products as well.